When I wanted to write about the opportunities you can find in listening to stories, I found myself hindered by three obstacles. The opportunities in listening to stories are so diverse and idiosyncratic that it's impossible to list predictable outcomes that will hold for all story projects. As an external consultant who catalyzes sensemaking but does not recommend solutions, I never arrive at conclusions or discover opportunities. At the end of every story project there is a "rest of the story" -- that is, what people do with what they have collected -- but I don't (and can't and shouldn't) try to participate in that part of the story. I help to set the story in motion, then step aside. My clients are not obliged to share the ending of their stories with me, and often they don't. For some story projects I do know the whole story of the project, but I am bound by agreements of confidentiality; so it's difficult to trot out detailed stories of how story projects helped people make changes. For many clients the things they found most useful were also the things they are least willing to talk about in public. So, what to do? How to talk about the wonders of story listening without spilling the beans or making things up? Here's what I decided to do. I pulled out and skimmed over all of the catalysis reports, workshop records, and other project-related writings I've created over the past ten years. Every time I saw an outcome (something found out, confronted, noticed, discovered, enabled, put in motion) I jotted it down. But I translated every outcome to something generic, like "So that's what has been happening!" When I got through all the project materials I could find, I had about 200 such outcomes. I clustered those, clustered the clusters, gave the clusters names, and removed all the redundant items. I tried to get each cluster down to ten items or fewer (but did not always succeed). In doing this little retrospective exercise, I translated from the specific to the general partly to get past any problems with client confidentiality, but more so to make the outcomes transfer better into any situation you might be facing. In doing this I hoped to communicate the scope of opportunities you can gain by listening to stories. I wanted to show you the lay of the land and give you a fly-over of what I've seen. These are all translations of real (usually much more detailed) patterns I and others saw both in stories that were told and in answers that were given to questions about stories. Remember that because most of these outcomes came from my contributions to story projects as an outside catalyst, I have no idea which of these things actually worked for clients. And some of the catalyzing elements I throw out to stimulate sensemaking are deliberately off-base. But still, I think you can get something useful for your story listening by poking around in these outcomes. Also note that in all of the outcomes here I talk about a fictional-composite "us" and a fictional-composite "them." Usually "they" are the people who told the stories and "we" are the people who asked them to tell the stories. These groups can be the same people, but more often they are not. Then she began looking about, and noticed that what could be seen from the old room was quite common and uninteresting, but that all the rest was a different as possible. 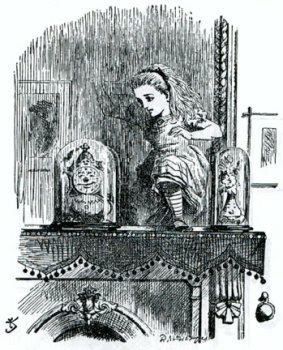 For instance, the pictures on the wall next the fire seemed to be all alive, and the very clock on the chimney-piece (you know you can only see the back of it in the Looking-glass) had got the face of a little old man, and grinned at her. This is an excellent metaphor for seeing yourself through the eyes of other people. When you look into a mirror, you see yourself reflected in a mechanical way: you look, but you do not move. Asking people questions in controlled surveys with closed-ended questions that exclude exploration is like looking into a mirror. 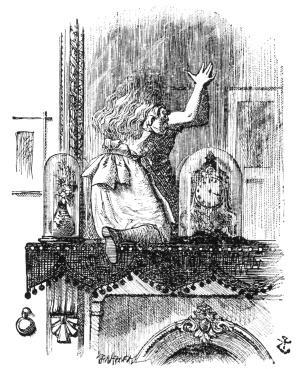 But when Alice climbed through the mirror into the other room, she saw things she could not have seen without going there. Asking people to tell you stories is like climbing through a mirror because you are asking them to bring you into their mirror world and show you around. When you immerse yourself in the stories people tell, you are not just looking into their world, you are going there. So the outcomes in this cluster all have to do with what people found out by climbing through the mirror. Is that really the way they see us? Do we really come off that way? I would have never thought people would use that word to describe us. It appears that people see our role as this, when we thought they thought our role was that. We thought they saw us as helpers, but they see as as unwelcome outsiders who don't understand and can't help. People don't think we know about this issue. They think we aren't aware of their problems with it. We thought the way they see us was simple, but it is complex and contradictory. These people feel they have a different relationship to us than these people do. That must be why they have interpreted our actions so differently. These people sure don't think anybody is listening to their needs, least of all us. So we see it like this and they see it like that. It's amazing that we could interpret the same thing so differently. That is not what we thought they thought that word meant. So that's how they have been interpreting that thing we said. That was not what we thought we were saying. We hadn't realized this issue could be looked at from that point of view. If they think that, it explains why they reacted to what we said in that way. Perhaps we should have said this instead. We never even realized people were seeing this as different from that. Now that we come to think of it, they are different, from that point of view. So if we hear this, from now on we know it means that, not that. We asked about this, but people responded with feelings about that. People interpreted this to mean that, which must mean they think this. Perhaps the way we asked this question led people answer in that way. Maybe that word cued them into a meaning we hadn't intended to convey. This cluster of outcomes has to do with gaining a better understanding of the characteristics and groupings of people who are telling stories. I'd say one of the most frequent positive outcomes of story projects is that people realize either that there are subgroups among the storytellers that were previously unknown, or that the subgroups that exist are different from was previously understood. These outcomes give people a sort of field guide to the groups involved in an issue so that messages and approaches can be tailored to what works best for each group. These people are held back by this, but those people are held back by that. We had assumed that all of the reasons people had for doing this were the same; but these people did it for this reason and these people did it for this other reason. We should not treat both groups the same way, because what works for one motivation will not work for the other. We had assumed those groups would be very different in their outlook, but these areas of commonality are surprising, and useful. This thing we've been doing seemed to be working because these people were responding favorably to it. But these other people had the opposite reaction, and we didn't see their feelings because the first group was more vocal. But the second group has been increasingly unhappy with what we've been doing, and that could be a problem. People in this situation need something quite different than people in that situation, but we have been treating them all the same. That might be why there has been such a variable response and outcome. So we've been paying more attention to these people than to those. No wonder that group feels upset. We thought these people had a problem with this, and they do; but it's a surprise that those people have a problem with it too. We thought everybody was concerned about this, but in fact only these people are concerned about it, and these other people are concerned about this other thing instead. These two groups of people are having contradictory reactions to our messages. For one group they are appealing but to the other group they are upsetting. It looks like the people in these different groups not only have different experiences with respect to this issue; they seem to also have different expectations about what the issue entails and what is normal. Wow, these people really live in different worlds. No wonder they don't see eye to eye. It looks like these people are making a lot of assumptions about those people that are not always based on accurate information. Perhaps helping them learn more would reduce some of these problems. These two groups define what is good and right differently. We hadn't realized that people with different backgrounds saw the issue so differently. These two groups of people seem to be working at cross purposes. When these people talk about this, they mean something different than when these people talk about it, and that is just because of the nature of their experiences being different, not because of any confusion or lack of education about it. It makes sense now that they would see it differently. So these people are afraid of that, while those people are afraid of that. I can see now why they seem to work against each other. Perhaps addressing this could help. The outcomes in this cluster have to do with getting to know people better: studying them, really. So that is what motivates them. Is that really the way they see themselves? These people are doing things for more complicated reasons than we thought. That was not what we expected people in that category to say. We will have to think again about that category and what it means. We hadn't realized these people feel that this issue is so central to their identity. If we seem to block them on that issue we are threatening them more than we thought. If we help them on that issue we may be able to help them more than we thought. Where people fall on this scale seems to have a big effect on how they responded to this issue. People don't seem to want to waste their time talking about this issue. This situation seems so dangerous to these people that they seem unable to talk about it at all. It looks like people felt they had to answer this question in only one way. These people are more proud of their ability to do this than we had realized. That fact that they said this means that they haven't thought much about that. They told a different story if they gave this answer than if they gave this answer. We always thought they were like this, but they seem more inclined to that. The people who it seemed would be most likely to say this said that, and vice versa. So that's why they did that. We never realized that was holding them back from doing what we thought would be easy for them to do. So this is why these people are so afraid of that happening. This must be a trigger for them. Maybe if we didn't do that they might not react so strongly. We had thought everybody would care about this issue, but it looks like whether people feel like they should care about this issue is heavily dependent on the role they see themselves as playing. This seems to be a problem for people, but they seem to think they can't do anything about it and are resigned. No wonder they feel hopeless. This group of people doesn't seem to see the problem we are trying to address at all. It looks like they don't think it exists. It looks like these people just can't do anything about the issue we have asked them to help us with. It's not that they don't care, it's that they are unable to help. So that's what these people want. We hadn't realized that people need that. We haven't been giving that to them. They say they want this, but they aren't aware that they really need that. Perhaps helping them with that will help them. We keep asking these people what they want, but they don't know what they want. They are more confused than we thought. We need to look into this more. They really need some of this, but we've been giving them too much, and it is having the opposite effect. We need to match what we give better to what they need. We thought we were overdoing this, but it looks like people want even more than we had been doing. We thought people didn't want to be bothered with this issue and so were avoiding asking them about it, but in fact they have been offended because they feel ownership for it and resent being left out of it. People seem to be saying that things used to be like this, and now they are getting more and more like that, and they wish it wasn't happening. Wow, they really don't like it when we do that. But they don't mind that. So they consider this a lesser evil than that. We thought they were the same. People really hate it when that happens. We thought this issue was hampering people, but it doesn't seem to bother them very much. So they like it when we do that! We were not even doing it on purpose. It's interesting that we got such a tepid response on this issue. We thought it was important to these people, but apparently they don't care about it. Nearly a standard result in story projects is that the elephants in the room break their silence and start loudly telling story after story to anyone who will listen. As a result it becomes impossible to continue to deny the existence of problems everybody knows about. This can have a cathartic effect on a person or group or population, in a workshop, in a private office sitting alone, in a building, across an organization. However, the moment when the elephants start to talk is also one of the most dangerous moments in a story project, because people are most likely to turn away or shred the project in reaction. That is one of the reasons why confronting a mass of collected stories is best done in the context of a sensemaking session. 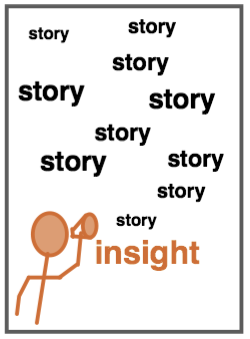 For example, say people have collected some hundreds of stories and they are going to have a few dozen people work with the stories in a sensemaking workshop. These people might think they should send out the stories for people to read before the session, as "homework," to save time for the more important activities that will take place in the session. I've seen that done, so I usually recommend against doing this and suggest handing out printed stories at the start of the session itself. Why? Because the context is different. If people are reading stories alone, perhaps in the midst of other work, they are not ready to hear the elephants talking and will dismiss or ignore them (and then the elephants will not attend the sensemaking session). But when people arrive at a sensemaking session and understand why they are there, they are ready to make the most of the opportunity of conversing with the elephants and learning from them. There is an element of ritual, of greeting the elephants if you will, that smoothes the transition to self-awareness. People really have a problem with this and need our help with it. We can't just keep ignoring it. We knew people didn't like this, but we were ignoring how much they didn't like it. So this thing we were trying to do to help is actually offending people. We didn't realize how much they were bothered by that failing in our approach. I guess we thought it was tolerable. We thought people knew we were struggling to fix this problem, but it looks like they think we don't care about the problem. We knew people didn't like these two things, but now we can see that this one is considered a minor annoyance, but this one is much worse. We thought that issue was very serious, but here is another issue that we hadn't even been talking about that seems like it may soon dwarf the first issue in terms of impact. Oooh, this could be a bigger problem than we thought. I guess it's time to start talking about this issue. The trend is worsening, not getting better. This is a portrait of a disaster waiting to happen. This is why things keep going wrong! People never talk about this issue, so we thought they didn't care about it, but from these stories it appears that they are taking it for granted and that we had better not stop making sure it is there for them. It looks like people have particular problems in these interactions with us, and these other interactions go more smoothly. So that's where those rumors have been coming from. We thought that the problem was caused by this, but in fact it looks like the problem is caused by this and that happening at the same time, with their effects adding up to the whole. We thought people were worried about this, but in fact they are worried about this and that at the same time, and we have only been addressing this. We had better start paying attention to that. This set of situations was described frequently and seemed to often lead to this outcome. Perhaps we can watch out for that situation and help people avoid that outcome in the future. It looks like people facing this situation/context have very different needs than people facing this situation/context. Perhaps we should start more carefully considering which set of conditions applies when we provide help. People need more help during this time than during that time. We should pay attention to whether people are entering this period in which problems tend to be more frequent. Perhaps this isn't a problem that can be addressed but is just something that is in the nature of the activity and can't be fixed. This approach doesn't work very well for this situation, but it does work well for that situation. We thought that this was causing that, but actually, from what people are saying, they think this other thing is causing it. We've been going about this the wrong way. Our way of thinking about this may be overly simple. So that approach is clearly not working. It sounds like it is making things worse instead of better. We thought this was working for people, but clearly it isn't. We had thought to address this in order to help, but it looks like addressing that would help more. Wow, people really think this is a bad idea. This approach is more of a double-edged sword than we had realized. The best story projects surprise people with new ideas. Being ready to be humbled by the wisdom of people who seem to know nothing about something you know a lot about is a prerequisite for getting anything useful out of listening to stories. We never realized that we could do that with that. If we changed this, we might get a better response than what we have been getting. This probably won't work for what we had thought it would do, but we've never realized we could use it for that. So this little thing could have an impact on that big thing? We had not thought of trying that. It looks like this thing that we were seeing as a problem is simultaneously a problem and an asset. I wonder what we could do to bring out the asset part of it. This looks like an opportunity to help people where we can really make a difference. Doing this looks like it would help people meet their challenges better. So this, when it is present, rubs off the rough edges and helps people get past obstacles. This seems to be something people wish could happen but don't really believe is practical. How much closer to that ideal could we help people get? This is a portrait of an effective solution. If we help these people with this, they should have less trouble trying to do that. We thought that these people couldn't help with that. But from these stories it looks like they could help and even be a resource for dealing with that. Why don't these people work with these people? They seem to share a lot. Maybe connecting them would help both groups. If we supported them in this, they might be more willing to help us do that. The people who are most able to contribute find these conditions. If we improve the likelihood of those conditions happening, we might be able to help more people contribute and help everyone else. Ah, so people need to be able to do this, but that prevents them from doing it. Perhaps if we help with that, they will be better able to do this. If we gave people this oppportunity, it looks like they would take advantage of it and help everyone by it. When people are thinking about this, they are less likely to do this than if they are thinking about that. Perhaps their frame of reference has an impact on the way they make this decision. We thought people weren't willing to be challenged in this way, but it looks like they would welcome the challenge and would rise to it. The common factor in these stories points to this issue. Perhaps if we can address that issue we can stem the tide and help people solve the problem. The last cluster of outcomes from story listening projects involves the impact not on those who listened to stories but on those who told the stories. The opportunity to be heard and to contribute can be the most important opportunity a story project provides. If lying to people about collecting their stories breaks the storytelling machine, truly listening to people, and making sure they know you are listening and value their contribution, has the opposite effect. It builds trust. I've seen projects that seized this opportunity and used it to change how people felt about and perceived both listeners and tellers, and I've seen projects that squandered the opportunity, even when it was badly needed. How you talk about the project to people is very important. It takes work and testing, but usually you can find a way to convey to a group of people that their unique experiences are valuable to something you all care about. One one project I remember we found that saying, "We want to know what this is really like" helped people understand what we were after; but it took several iterations to get to what worked. It's different for every group, and it may be different for subgroups as well. How you collect stories and what you do with them also has an impact on trust. For example, say you put out a report on a new policy direction that includes not only the insights arrived at in a sensemaking session, but also all the original stories from which those insights flowed. When the storytellers see how their unique experiences contributed to the new direction in policy, they see what they did to help and will be willing to help again (and perhaps most importantly, see themselves as someone who helps). But if you listen to them without giving them any indication that you used what they said, they may assume (rightly or wrongly) that you discarded their contribution. It can sometimes be hard to admit that grand policy conclusions were based partly on simple stories. Sometimes the experts in the group find it hard to share attribution with the laity. To be honest I've seen few projects that were willing to keep storytellers in the loop as the results of story listening were brought out. But when I have seen it done I've been amazed by the energy it has produced; and that is energy that future projects can tap into. People certainly have a lot of energy around this issue. When people talked about this they seemed to perk up. The exchange of stories in the group went way up when we introduced this topic. I wasn't sure people would open up about this issue, but we seem to have hit a vein on it. One of the people asked me after this session if they could come to another one. Watching that man's face when he told that story was amazing. He must be so proud of that accomplishment. That person really needed to tell that story. At first it looked like half the people were going to walk out! But in the end I think people were sorry when it was over. That story just came spilling out, didn't it? It was amazing how that particular story rippled through the whole group and made so many more stories come out. I've noticed a change in how people talk about the project, now that they've actually contributed some stories. Word is getting out and more people want to be involved in it. With that our fly-over view of the story-listening land of opportunity comes to a safe landing. I hope it has been helpful in planning your own journey.